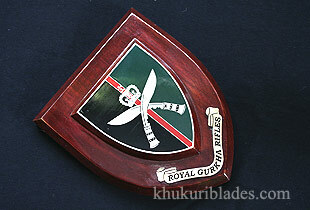 RGR (The Royal Gurkha Rifles) were raised in 1st july 1994. The first Battalion was raised in Kongkong, the second in Brunie and the third in UK. As part of the British Army defence cuts, regiments were reduced in numbers, the 2nd, 6th, 7th, and the 10th Gurkha Rifles were merged to form the Royal Gurkha Rifles. Each battalion consisted of about 700 officers and soldiers. Initially there were 3 Battalions of the Royal Gurkha Rifles (RGR). 2nd Gurkha Rifles and the 6th Gurkha Rifles were merged into the 1st Battalion, 7th Gurkha Rifles merged into the 2nd Battalion and the 10th Gurkha Rifles merged into 3rd Battalion. On 6th Dec 1996, the regiment reduced to 1st and 2nd Battalions only.